Blog - Toronto, Hamilton, Mississauga | Vital Management Inc. If you ever need to relieve some stress after a frustrating day of work, why not try martial arts? It is a great way to get in shape and offers a high intensity workout that activates your body on a different level. What’s more, is you’re also learning some valuable self-defense moves in case you ever face any real danger. Many people exercise alone. A quick look around at the gym will verify this as you notice solo runners on the treadmill and muscly dudes moving across the free weight floor. The truth is a lot of us don’t consider bringing a friend to the gym. But why not? And why not bring one of the most important people in your life - your significant other? Exercising with your partner can be rewarding and offers some notable benefits. 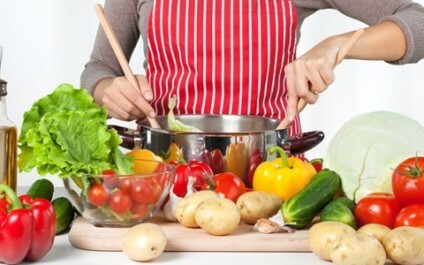 Committing to a healthy lifestyle can be tough, especially when you have very little experience in the kitchen. With such a busy schedule, it’s hard to stick to a strictly healthy diet as well. There is also a misconception that healthy eating means that you’ll only be eating bland and unexciting meals everyday. As a runner you’re going to find yourself at a crossroad. Should you work up a sweat outside or do you pay your local gym a visit and run on their treadmill for 30 minutes? This is a question that many runners face and while some may think that both are exactly the same, there are clear differences and advantages to outdoor and indoor running. “I tend to think of myself as a one-man wolf pack. But when my sister brought Doug home, I knew he was one of my own. And my wolf pack... it grew by one... And six months ago, when Doug introduced me to you guys, I thought, ‘Wait a second, could it be?’ And now I know for sure, I just added two more guys to my wolf pack. More women have taken to strength training and building muscle to help them quickly lose fat and get a toned body. But what if you don’t want to go to the gym or if a membership is a little out of your budget? Fortunately, there are plenty of strength training workouts you can do by yourself with little to no need for any exercise equipment. Are you a morning person or an evening person? When it comes to working out, people have different preferences. While some would not mind waking up at five in the morning to start exercising, some would much rather sleep in and just train after work. After successfully dieting for several months, you have a slip up. And not just any slip up, but the BIG one. Maybe you devoured an entire pizza after a bar crawl, or maybe you failed to restrain yourself while at a buffet with friends. Whatever the reason, it’s not important.